16 Items. Showing Items 10 thru 16. GEORGE PEABODY (1795-1869) Entrepreneur and philanthropist who founded the Peabody Institute. 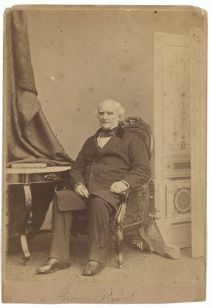 Cabinet photograph of a seated George Peabody. Notation below image identifies Peabody. Backstamp reads: “Gurney,” seal and motto on back reads: “I have chained the sun to serve me.” Some edge wear. An unusual cabinet of Peabody. Overall Fine. [LINCOLN]. CDV. No backstamp. Ostendorf variant Ostendorf-92. No backstamp. Variant of an original taken by Anthony Berger. Minor bend in lower left. Fine. 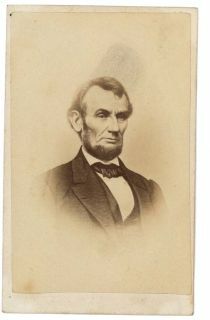 [LINCOLN DEATHBEAD]. CDV. Artist’s rendition of the scene at Lincoln’s deathbed. No backstamp. Excellent. [LINCOLN FAMILY]. CDV. As Ostendorf states Artist’s conception of the Lincoln family, originally printed as a lithograph. Robert T. stands behind his father, Tad is at the President’s side, and Mrs. Lincoln appears on the right.” No backstamp. JAMES WOOD Member of the New York state senate 30th District, 1870-1873. Signed Photograph of Wood. 8” x 10 3/4”. Geneseo, New York. 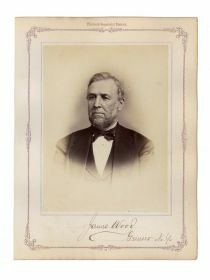 Thirtieth Senatorial District image of Wood Signed, “James Wood Geneseo, NY. “ Very Fine. 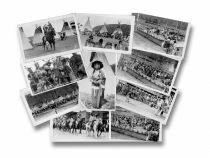 A superb collection of ten real photo post cards most likely showing members of the Black Feet tribe at Fort Benton, with one card identifying the subjects as members of that tribe. The various views include tribal dances, meetings and Indian elders. A great collection from Leos’ studio with photo credit given to an “A.E.Forde” and two cards dated June 17, 1937. Included is another photo post card entitled: “Going to the Sun Camp, Horses ready for trail, Glazier National Park” published by Hileman with slight paper loss in lower left corner, and another post card sized photograph of a man peering into an abyss and identified and “Many Glacier” on verso. Two of the cards have slightly creased corners, else very good. A very scarce cabinet photo of the purportedly all woman’s baseball club for the season of 1890 & 1891. The team was managed by W. S. Franklin. TheAlong with the manager’s imprinted name are the player’s as follows: Effie Earl, Deith Mavves, Alice Lee, Rose Mithcell, Angie Parker, May Howard, Annie Grant, Kittie Grant, Nellie Williams. The team is dressed in striped skirts with and hats with kneck bows. While the team played as an all female club, it is thought that perhaps two or three of the players were actually men dressed as women. The albumen photo and printing were placed offcenter upon the card and as a result, a bit of the printing is missing. A choice piece of early baseball history.